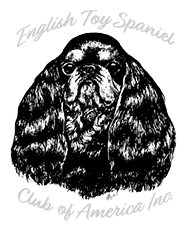 As with any breed one must consider its key characteristics -- the vital features that go into the making of an English Toy, and what sets it apart from other toy breeds. One would think ours is an easy breed to pass judgement on. I read an article by Cindy Vogels discussing the challenges of judging a low entry breed and the near impossibility it is for new judges to fulfill their required criteria. Through no fault of their own they enter the ring with minimal experience. Unfortunately this stems from the lack of dogs, breeders, and written materials available. In this breed Specialities are few, I believe only two are held each year and only the parent club hosts an educational seminar following the National. In spite, one judging this breed should still put their full efforts into truly understanding the breed and not pass on it as a one or two dog entry breed or as a step closer to completing the Group. In the opening paragraph of our breed standard it states that the important characteristics of this breed are exemplified by the head. Please note that without this feature it is not an English Toy. While much of what I write will appear as echoes and verbiage from old-time and current breeders it was through their teaching, and, through general conversations that I owe an understanding of the breed. Still, it ought to be decidedly “cobby” with strong stout legs, short back and wide chest. Many of today’s Toy Spaniels fall short of this visualization with longer backs and racy streamline bodies prevailing. Although this might appear stylish to some, it is incorrect. Examination of the bite should be limited to running one’s thumb gently under the front lip or merely lifting the front lips. The fact that this is a short faced breed with a jaw well turned up should indicate the slightly undershot jaw as acceptable. Do not fuss to much in this area by trying to pry open the mouth the dogs often object to it and can often be interpreted by the exhibitor that the judge does not know what he is doing. Unless one sees a tongue hanging, teeth exposed or a visible wry jaw -- move on. The head sets this breed apart from all others and in judging one should look for a large round head with great, high doming. The muzzle square, broad with a deep well turned up jaw. Cushioning under the large, very dark round eye gives the head it’s soft, plush, chubby appealing and intelligent expression. The eyes should be directed straight forward and set on line with the nose there should be no white around the eye. The ears should be low set and heavily feathered. At first glance the head will appear larger than necessary for the dog. There seems to be some confusion on what is meant by doming; conversations lead me to believe this is often misinterpreted as the area from ear to ear, not so, it rises high out of a very short (almost non existent) muzzle, there should be a hollow between the eyes. It should be round, possessed of height, curving out over the eyes and having upward lift off the set of the laid back nose placement. Please remember that “round is round” and the English Toy head should never exhibit any indications of being oval or flat. The neck is of moderate length and nicely arched. The topline level. Shoulders are well laid back, boning heavy to moderate, legs straight and pasterns strong. Do not be taken back by the presence of fused toes front or back. They are acceptable. Rear quarters are to be well muscled and nicely angulated. What judges see in the ring are for the most part young adolescent exhibits not yet manifesting the broad backs, deep briskets, good ribs and sturdy frames found on older specimens. The English Toy is very slow maturing both in body and in coat and unfortunately I feel we tend to show our dogs too young. Outside of our National Specialty and the days following the event would one ever have the opportunity to fall upon an entry of more than a handful of mature animals. Unlike other breeds where multiple entries occur at local shows and regional specialties. The English Toy National is the only major gathering of the breed with sometimes close to 100 entries. It is a must for anyone interested in learning, seeing and talking about the breed. While there may be some controversy existing on the over trimming of the breed, I personally find no objection to tidying up the exhibits. What is objectionable is the lack of knowledge on the part of judges who fail to recognize type on the less or non-scissored specimens. Be mindful that this is a profusely coated breed, silky and glossy in texture with provisions against over trimming. Be aware that the coat ranges from straight to slightly wavy. Award your placements on the merits of the animal and not on the handicraft of a strippling knife and a pair of thinning shears. Do not assume that the naturally presented specimen is the lesser of the group. This breed is not intended to be presented as a Springer or a Cocker Spaniel. One other area that seems to confuse judges is the tail. Docked to 2-4 inches it is set at the back’s level and is carried slightly above the level of the back. Acceptable also are dogs born with shorter or screw tails. Judges not familiar with the standard appear perplexed when they run across a screw tail. It is obvious they don’t know what to do with it. It is acceptable. In regards to color, the standard is pretty clear. My only comment would be to mention that the Blenheim and the Ruby do not always gain the length of coat or ear fringes found on Prince or King Charles. On gait, structurally there has been significant improvement. On this issue let’s not forget the “hallmark” of this breed and resort to generic judging. Sometimes these little dogs do not care to move; however, should the fancy strike a hackney gait is incorrect. Historically let’s remember their origins as a lap dog, never intended to game, hunt or flush their purpose only to serve as a comforter spaniel, an aristocracy’s playmate; a true toy -- the proverbial pillow dog.